Potential coalition partners Labour and the SNP have clashed in a war of words over putting party before city. Newly-elected Labour councillor Scott Arthur sparked the row when he used a blog to claim SNP group leader Adam McVey had failed to stand up for Edinburgh after the Evening News revealed the Scottish Government has vetoed cash from the City Deal going to fund an extension of the tramline. But senior Nationalist councillor Gavin Barrie responded via Twitter, asking why Labour had “chosen not to govern” by stalling on a new coalition deal following the May 4 council elections. A deal has been negotiated between the SNP and Labour council groups, but it must be approved by Labour’s Scottish executive and a go-ahead is not expected until after the general election on June 8. In his blog, Cllr Arthur wrote: “Cllr McVey is the SNP group leader in Edinburgh and aspires to lead the council. 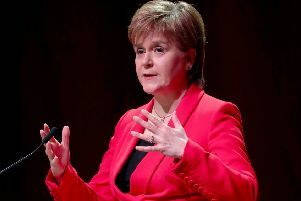 “In this role he would have a duty to put Edinburgh before Nicola Sturgeon. “I’m therefore disappointed to see him buckle so readily when his party’s elite suggest they will remove funding from the City Region Deal for the £162 million tram extension down Leith Walk and on to Newhaven. The spat comes after Labour was accused last week by the Tories of deliberately delaying any agreement for political purposes and “holding the city to ransom”. The SNP is now the biggest party on the council with 19 seats, while the Tories have 18, Labour 12, the Greens eight and Lib Dems six. Councillors are due to decide soon on whether to go ahead with the tram extension. Labour is committed to the plan and the SNP backs it in principle.